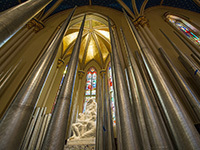 After 10 years of planning, the Murdy Family Organ has reached its permanent home inside the Basilica of the Sacred Heart. Originally published by John Nagy ’00M.A. at news.nd.edu on August 05, 2016.